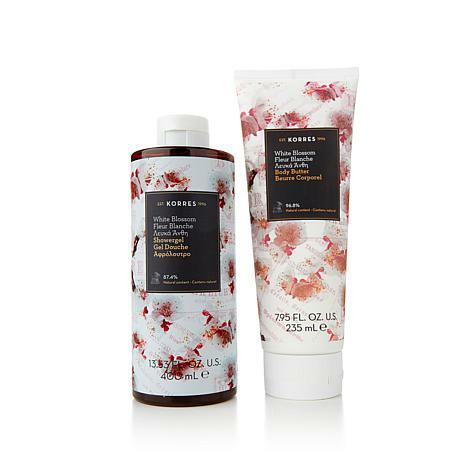 Transport your senses to a field of blossoming white flowers with this luxurious shower gel and body butter duo. The moisturizing formulas help rejuvenate the look of your skin, leaving it feeling soft and soothed. Let their light, fresh scent transform your morning routine into a spa-like experience. Ingredients: Aqua/Water/Eau, Cetearyl Alcohol, Prunus Amygdalus Dulcis (Sweet Almond) Oil, Glycerin, Coco-Caprylate/Caprate, Dicaprylyl Carbonate, Helianthus Annuus (Sunflower) Seed Oil, Dicaprylyl Ether, Squalane, Butyrospermum Parkii (Shea) Butter, Persea Gratissima (Avocado) Oil, Parfum/Fragrance, Cetearyl Glucoside, Alcohol, Alpha-Isomethyl Ionone, Ascorbic Acid, Ascorbyl Palmitate, Benzyl Alcohol, Benzyl Salicylate, Ceteareth-33, Citral, Citric Acid, Citronellol, Hexyl Cinnamal, Hydroxycitronellal, Imidazolidinyl Urea, Lactic Acid, Limonene, Linalool, PEG-8, PEG-40, Hydrogenated Castor Oil, Phenoxyethanol, Potassium Sorbate, Pyrus Cydonia Fruit Extract, Tocopherol, Vitis Vinifera (Grape) Seed Extract, Xanthan Gum. Ingredients: Aqua/Water/Eau, Sodium Laureth Sulfate, Cocamidopropyl Betaine, Sodium Cocoyl Isethionate, Coco-Glucoside, Glyceryl Oleate, Parfum/Fragrance, Aloe Barbadensis Leaf Juice, Althaea Officinalis Root Extract, Arginine, Benzyl Alcohol, Benzyl Salicylate, Castoryl Maleate, Guar Hydroxypropyltrimonium Chloride, Hexyl Cinnamal, Hydrolyzed Wheat Gluten, Hydroxycitronellal, Imidazolidinyl Urea, Lactic Acid, Limonene, Phenoxyethanol, Polyquaternium-7, Potassium Sorbate, Sodium Benzoate, Sodium Chloride, Sodium Dehydroacetate, Sodium Gluconate, Tocopherol. I love the delicate floral smell of this product, and the pleasant scent lasts for most of the day. The shower gel makes a nice lather and it helps my dry skin feel very moist and fresh. My skin just drinks in the body butter and it feels so soft. Love the body butter!! It's helped my dry elbows!! Baby soft now!! I love this Violet fragrance especially the body wash. If and I sure hope you make a body spray or perfume please don't put a woodsy note in it you do with most of your fragrances, I really don't want to smell like a cedar chest. Just mirror your already perfect scents. Like White blossom, which the perfume was woody, Jasmine and Violet. 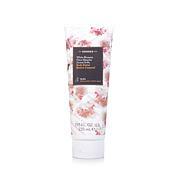 I'm so in love with Korres' floral shower gels and body butters!! I could swim in them!! This is pure heaven!! They need a matching perfume!! It's not a heavy floral at all. Just a clean violet floral. I'm obsessed! Korres Pure Greek Olive Oil & Honeysuckle Shower Gel - 8.45 fl. oz.